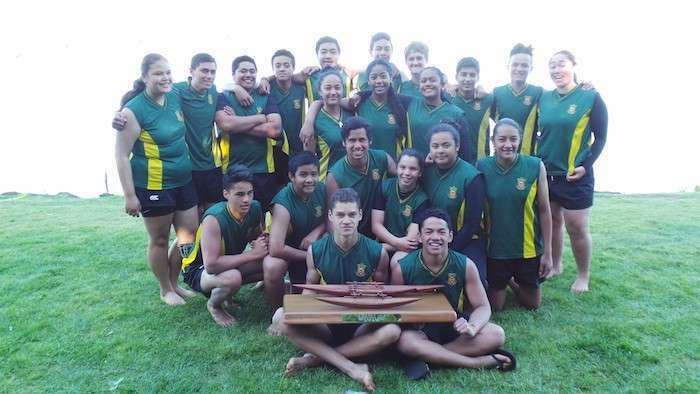 Manurewa High School dominated the competition at last Saturday's Waka Ama Auckland champs, held at the Orakei Basin. Division One W6 boys 250m - 1st place. Team: Pafe Momoisea, Sean Maireroa, Tehiiringa Tane, Kayle Poinga, TJ Talalelei, Tim Dreadon. Team: Teia Mohammed, Carmel Nickle, Madison Harvey, Lena Ngatai, Amelia Pasikala, Katie Lowry, Pafe Momoisea, Sean Maireroa, Tehiiringa Tane, Kayle Poinga, TJ Talalelei, Tim Dreadon. Division One W6 mixed - 1st place. Team: Pafe Momoisea, Sean Maireroa, Tehiiringa Tane, Carmel Nickle, Lena Ngatai, Katie Lowry. Division One W6 boys 500m - 3rd place. Division One W6 girls 500m - 5th place. Team: Teia Mohammed, Carmel Nickle, Madison Harvey, Lena Ngatai, Amelia Pasikala, Katie Lowry. Division Two W6 mixed 250m - 2nd place. Team: Teia Mohammed, Madison Harvey, Tim Dreadon, Kayle Poinga, TJ Talalelei. Division Two W6 boys 250m - 3rd place. Team: Eucharist Ieremia, Paschal Koteka, Everton Newton, Raghav Narula, Jay Inthavong. Outstanding performances came from the 3 teams that placed 1st, particularly our W6 boys 250m team who faced stiff competition in their final. Although seeded 2nd heading into the final race our students found another gear to finish strongly. "I was really impressed with this team's composure. Three new boys in the team had only paddled for a total of 4 weeks, so they needed to remain calm and race their own race. They did that and I’m really happy for them. They have worked tirelessly," said Coach Ms Melina Martene. The top junior paddlers will begin training alongside the top seniors for the 2015 Club Nationals held January in Cambridge. A group of senior students provided fantastic support for the juniors - thank you to Bailey Hoera, Jade Hoera, Pearl Rhind, Deschlla Leaso, Drew Ofanoa. The Waka Ama teams were coached by Mel Martene and Managed by Maggie Silva.